Detail of Gilbert “Magu” Luján artwork at Hollywood / Vine Station. One of the founding members of the celebrated Chicano artists collective “Los Four,” Metro commissioned artist Gilbert “Magu” Luján, will be featured in an upcoming retrospective Aztlán to Magulandia: The Journey of Chicano Artist Gilbert “Magu” Luján, part of the Getty’s Pacific Standard Time: LA/LA initiative. This retrospective highlights Luján’s iconic career as a Chicano artist by deeply surveying a diverse array of artwork from sketches and drawings to paintings and sculptures – including eight original artworks from Metro Art’s permanent art collection. 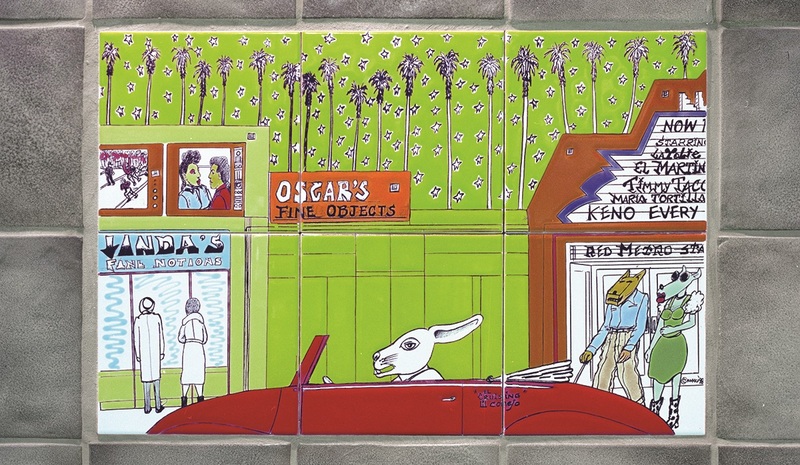 The loaned artworks, titled La Pookie, La Carwomen, Looking for Love, Cruising Hollywood Hills, La Musi, Hollywood and Hot Dog House, are part of a series Luján created for Hollywood/Vine Station in 1999. Ranging from colorful drawings to ceramic tiles on wood, this series depicts the history, glamour and excitement of the Hollywood film industry’s yesteryears and its majestic movie palaces. Learn more about the artwork here. Aztlán to Magulandia: The Journey of Chicano Artist Gilbert “Magu” Luján will be on display from October 7 to December 16, 2017 at UC Irvine’s free university art galleries: Contemporary Arts Center Gallery and University Art Gallery. The public is invited to meet the curators during the exhibition’s opening reception Saturday, October 7 from 2 p.m. to 5 p.m. You can reach the UC Irvine galleries via OCTA Bus Line 79 or 213 to West Peltason-Mesa.